The kickoff reception for the Fall Symposium will be held on Sunday October 9th. The Fall Symposium will begin at 9am est. on the campus of Notre Dame in South Bend Indiana on October 10th 2016. Overnight accommodations will be at The Morris Inn and a group rate will be established this summer. October 10th 9:00 a.m. - 2:30 p.m. The Spring meeting for IABHE has been canceled. The Fall symposium is scheduled for October 9-11 at the campus of Notre Dame in South Bend Indiana. If you have already registered for the Spring meeting, you will be issued a refund. Indiana Association of Blacks in Higher Education is comprised of persons who are involved in some facet of post-secondary education in the State of Indiana and who are concerned about the quality and delivery of educational services to Blacks. Indiana Association of Blacks in Higher Education is a not-for-profit corporation with 5013(c) status on September I, 2015, pursuant to not-for-profit law of the State of Indiana. The mission of the Indiana Association of Blacks in Higher Education, a voluntary association of persons and organizations in the State of Indiana, is to improve the status and participation of Blacks in higher education and to provide leadership and advocacy in the development of policies which will enhance educational, professional and cultural opportunities for Blacks in postsecondary institutions. Establish and support efforts in strengthening the IABHE’s relationship with the American Association of Blacks in Higher Education. All other individuals who support the interests, goals and objectives of the Association. Professional Members: This class of members shall consist of individuals employed by Indiana institutions of postsecondary education holding appointment/rank as faculty or staff. Active professional members (e.g., dues paid) are eligible to vote and to hold office. Associate Members: This class of members shall consist of all individuals not qualifying for professional or student membership, but, who have an interest in the philosophy and vision of IABHE. Associate members are encouraged to participate in discussions; but are not eligible to vote. Student Members: This class of members shall consist of students, both full and pan time, who are enrolled in degree programs in Indiana institutions of postsecondary education. Student members may serve on committees, but, are not eligible to vote. Institutional Members: This class of members shall consist of entities, associations, and institutions of a nonprofit nature, who support the work of IABHE (typically colleges, universities, etc.). Their specific roles shall be defined by the Executive Committee, but, generally such entities shall have one person designated as the representative, who may vote on issues. Corporate Members: This class of members shall consist of entities, associations and institutions of a for-profit nature, who support the work of IABHE (typically business and industry). The specific roles shall be defined by the Executive Committee, but, generally such entities shall have access to publications, minutes, and other documents of IABHE. Campus-Based Chapters: This class of members shall consist of campuses across the state wishing to address campus-specific issues under the umbrella of IABHE. Such entities shall operate specific campus chapters on the campuses of an Indiana college or university. Its members shall hold individual memberships in the parent organization and shall be comprised of not less than six members. Specific guidelines for the establishment and operation of such chapters are set forth in the document entitled: Guidelines for the Establishment and Operation of Campus Chapters. The annual fees for each class of membership shall be set by the Executive. Membership fees are due and payable on October 1 of each year. Members shall be considered to be "active" when fees are paid for the current year. Membership fees paid after April 1 in any year shall accrue NOT to that year, but to the succeeding year. The membership year shall be from October 1 to September 30 of the next year. Only active members in the Professional and Institutional categories shall have the right to vote and hold office. At any annual or special meeting of members, one-fifth (1/5) of the active Professional and Institutional members eligible and in good standing, shall constitute a quorum for all purposes except as otherwise provided by law or these By-Laws. A quorum of the Executive Committee shall be a simple majority of those in office. In case a vacancy occurs in the office of president, the vice president with seniority (e.g. the longest continuous service as a vice president) shall fill the vacancy until the next election is held. In the event of subsequent vacancies in the office of president, the order of succession shall be the other vice president, the secretary, then the treasurer. Vacancies, other than in the office of president, may be filled on interim basis as provided below. In case a vacancy occurs in among the officers, the president, with the advice and consent of the Executive Committee, may appoint a person to serve until the next election. Any officer or member of the Executive Committee may be removed for cause by majority vote of the Executive Committee, or by a majority vote of eligible members at a special meeting called for that purpose. The Executive Committee shall, between meetings of the membership, have all the powers and duties lawfully delegated. The Executive Committee shall meet to transact business at the request of the President or any three (3) members of the Committee. Meetings of the Executive Committee may be conducted via telephone conference call or via the internet. IABHE shall hold a General Meeting of the membership in the Fall to conduct business and transact other organizational matters, and a Professional Conference in the Spring to present and discuss issues of general concern, research, and best practices. The Spring Conference shall be open to all members and other interested persons. Special meetings of the Association may be called by the Executive Committee or upon written demand to the Secretary of the Association by at least one-fifth (1/5) of the voting members in good standing of the Association, but in no event fewer than ten (10) voting members in good standing. Written notice of meetings shall be provided to all persons affected as follows: not less than ten (10) days for the Steering Committee and the Executive Committee, and not less than thirty (30) days for meetings of the membership. Notice of all meetings shall state the purpose(s) for which it is to be held. Any action required or permitted to be taken at any meeting of the Executive Committee, or duly constituted committee, may be taken without a meeting by providing the secretary with a written summary of action(s) taken, signed by each member of the group involved. Business conducted in this manner shall be fully reported in subsequent minutes of the Executive Committee. The official record of all actions taken at any meeting of the Executive Committee, the Steering Committee, or the general membership shall be maintained by the secretary and reported in subsequent minutes of the respective bodies. Proceedings of IABHE shall be governed by the most recent edition of Robert’s Rules of Order. A person knowledgeable of parliamentary procedures, and thoroughly familiar with the organization's by-laws, may be appointed as Parliamentarian by the President. The authority to alter, amend or repeal the by-laws shall lie with the Executive Committee. Proposals to amend the by-laws may be initiated by the Executive Committee, by unanimous recommendation of a standing committee, special committee, or campus chapter, or by petition signed by any seven (7) active professional members. Proposed changes shall be submitted in writing to the secretary at least thirty (30) days prior to the next scheduled meeting of the Steering Committee. The secretary shall immediately distribute copies to the Executive Committee, and shall notify IABHE membership of the general nature of the proposed amendments and the date when the Executive Committee shall consider the proposed amendments. For adoption, an amendment must receive a two-thirds (2/3) affirmative vote of the full Executive Committee. During debate, any IABHE member (in any membership category) may speak for or against proposed amendments. Amendments adopted shall become effective at the close of such meeting, unless otherwise stipulated. The secretary shall notify all IABHE members of the results within 30 days after the vote. Amendments to the by -laws shall not be in conflict with the Articles of Incorporation. The president shall preside at all meetings of the general membership and the Executive Committee. The president shall appoint annually the chairpersons of all standing and special committees with the advice and consent of the Executive Committee, and perform such other duties as may be prescribed by Robert's Rules of Order The president shall be the official spokesperson for the Association at public functions. The vice president for Internal Development shall assist the president at his or her request and shall preside over meetings in the absence of the president. The vice president shall provide guidance and coordination of activities of the standing committees concerned primarily with internal development including program, finance, public relations, and membership. The vice president shall also serve as a liaison between campus-based chapters and IABHE. The vice president for External Development shall assist the president at his or her request and shall preside over meetings in the absence of the president and vice president for internal development. The vice president for external development shall provide guidance and coordination of activities of the standing committees concerned primarily with external development such as education, governmental affairs, and annual conference. The secretary shall keep an accurate record of regular, special and call meetings of the Association. Such records shall be written and permanently maintained. The secretary shall provide written notice of all meetings to paid members of the organization and shall file such reports as may be required by applicable laws, or customs of the Association. The secretary shall mail minutes to all paid members of the Association. Official documents of the Association shall be housed by the secretary. The treasurer shall be the chief financial officer of the Association, insuring the safekeeping, depositing and recording of all funds. The treasurer shall co-sign with the president all checks, money orders, etc. for payments authorized by the membership during regular sessions and by the Executive Committee when the Association is not in session. The treasurer shall also pay in a timely manner all financial obligations incurred by the Association and authorized for payment by the Executive Committee or the Association, and shall maintain an official roster of paid members. The treasurer shall prepare an annual financial report in consultation with the Finance Committee for the general membership and for the state and federal governments as required under its nonprofit status. The treasurer shall file for audit, all appropriate papers. The treasurer shall serve as an ex-officio member of the Finance Committee. Monitor and inform members of significant issues in higher education affecting IABHE goals and objectives; act as liaison between the Association and other organizations of educators; and research and formulate policies for Association response to issues in higher education. Construct an annual IABHE budget, monitor the efficient use of the Association expenditures; identify sources of revenue to support IABHE programs; and plan fund raising events, as appropriate. Governmental Affairs Committee Provide liaison with and inform membership of the activities of public officials whose policies affect higher education in Indiana; formulate strategies for responding to pertinent issues; represent the Association at meetings and hearings, when appropriate. Encourage and lend assistance to colleges and universities in their efforts to improve the participation and attainment of Black students, faculty, and staff; encourage IABHE membership growth; act as liaison among the various campuses; and publish a membership directory and conduct a membership drive annually. Observe the work of officers and committee chairpersons and members; prepare a slate of officers for consideration by the membership; conduct annual elections. Develop program plans for the Association to achieve its goals and objectives, including a strategic plan and operating plan, to be presented at the Fall membership meeting; develop such workshops and seminars as necessary for the professional development of IABHE and its members in achieving the goals of the organization. Interpret the mission of the organization to the various media, prepare and disseminate newsletters and brochures articulating the programs, accomplishments and positions adopted by the Association. Plan a cutting edge annual conference for IABHE with appropriate sessions for faculty, staff, students, members, and corporate members from all Indiana higher education campuses. 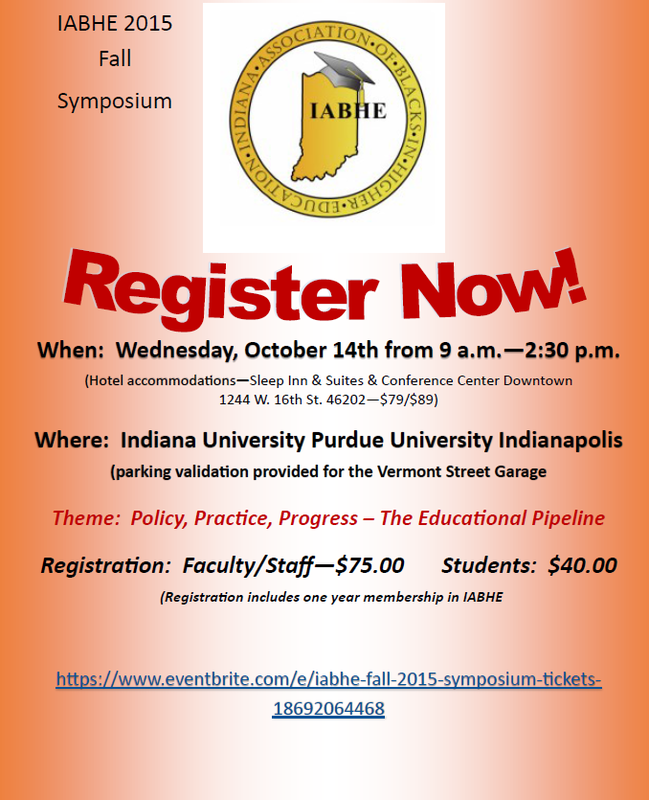 Thank you for participating in this year's IABHE Symposium! I hope you are having a comfortable start to the new academic year. Moreover, the Indiana Association of Blacks in Higher Education (IABHE) planning team would like for you to join us at the University of Indianapolis on Tuesday, October 14, 2014 for the Second Annual Symposium. Note that the registration fee does include a ONE YEAR MEMBERSHIP to the IABHE! It is our goal to provide members with an annual symposium, information on issues impacting people of color in higher education, IABHE social networking functions twice during the academic year, and the formal establishment of the organization. Please spread the word that the IABHE will be gathering again and we want our organization to grow.